Keeping up with the Starks, Lannisters and Targaryens is easy with HBOGO. Which is good for you and HBO too. In Time Warner’s recent earnings it was reported that HBO saw continued growth of subscriber numbers and CEO Jeff Bewkes commented that he didn’t see any reason to change the company’s primary revenue model of bundling the service with pay television providers. Many were disappointed, as they would like HBO to be freed of the tyranny of the bundle, so that they could subscribe directly to the service. I don’t think people really understand the money at stake here. Allowing customers to buy the app directly would seriously cripple the bundle model and deprive Time Warner of a revenue source that has been sterling for the company. But the company was smart enough to understand the usage trends and built the HBO GO app for smart televisions, tablets and phones. I’m sure they were hearing strong demand from their subscribers on the subject. As Jenna Wortham reported last April, there’s a workaround to get the service. Share the account. That’s right, more than one person can watch HBO GO at the same time, as long as they have a legit username and password. So your friend can slip you the credentials, and voila! All the Game Of Thrones you want. Jenna talked to an HBO exec who mentioned he didn’t think it sharing accounts was a problem (for the record: it’s illegal to share credentials in many states and violates the end user agreement that governs the app). From my experience at Rhapsody, content owners are extremely worried about shared accounts. The working theory is the dorm floor problem: one person subscribers and everyone on the dorm floor uses it. How much this goes on is questionable. What isn’t questionable is that customers hate one account, one stream. We could only allow for a single stream on all of our products, regardless of what the customer paid. Here’s what I think is going on. HBO knows what’s happening with multiple streams on an account. And they don’t care. In fact they are using it as a rear-guard defense for the day when the bundle goes belly up. Because they’ve produced most of the content on the app (it’s easy to forget the company started by offering second run movies and not the producer of must-see series), Because they’ve produced so many of their own series, HBO has much more latitude with what they can do with the catalog. So while other competitors may have to limit access due to licensing agreements, HBO allows some sharing (I hit a roadblock after starting three streams). It leads to fewer customer problems, but might it also be building their next generation of subscribers? Which brings me to an advantage that can’t be understated: the water cooler effect (which could also go by its other the name–Twitter). The more people who watch a show, the more they are going to talk about it. And the more people talk about it, the more buzz the show creates, making it required viewing. So by being looser with streaming rules HBO is building stronger social buzz around the show. I don’t have data to support it, but the Game Of Thrones (don’t tell me, i’m still behind) last couple shows in the previous season seemed to be so much bigger than it had in the past, which led me to think that more than their subscriber base watched it. Could that have been the HBO GO effect? Maybe we should think of HBO GO as really cool club. As long you know the one person who can get past the bouncer, you’re all good. It’s a good deal for the new customer. But not so much for the current subscriber. I’ve been a strong advocate of satellite television and have been a subscriber for over a decade. And to that end I’ve been extremely loyal to my provider, DirecTV. I’ve had the service in three different residences. I paid for the highest tier of service just to get everything–no need to mess around with the budget tier only to find out I don’t have NBC Sports Network when the Tour de France comes around. I subscribed to MLB Extra Innings package just so I could have it on my TV to watch the Cubs every day I can stomach it (which, I know, questions my sanity). I have put up with an excruciatingly slow guide experience as compared to cable. But how did I know last November when I finally converted to HD after holding out for years that it was sowing the seeds to destroy our relationship. When I moved this time in December, I was bummed to find out we don’t have access to the southern sky, which means no satellite. I called up DirecTV and told the customer service rep regrettably I had to quit for now, but I would come back when I could. So I was kind of surprised when the rep said there might be an early termination fee (ETF). Does an 11-year subscriber sound like someone who’s terminating early? Fortunately I was relieved when the rep said that the ETF was waived since the HD receiver I added last year was replacing a box. All I had to do was to return the receiver to DirecTV in a shipping container the company would send me and we’d be set. Since I left my receiver at my old place, I asked the rep to send it to my friend who now lives there. The rep said sure, no problem and we we were set. Until I got my final invoice. Instead of a check for a partial month of service, I got a bill. It seems that I did have to pay the early termination fee, and unlike a cellphone company ETF’s that get smaller every month of the contract, I had to pay the whole $200. By the way, when I ordered the new receiver, the rep didn’t say I was signing up for a long-term commitment with DirecTV. Oh yeah, and I had to pay $199 for the privilege to lease, not buy, the receiver. And since the rep didn’t address the return boxes to the new occupant, they were forwarded to my new place in Seattle, meaning I got it nearly two weeks after the company mailed it. So DirecTV also tacked on another $150 for not returning the box within their seven day rule. In all, DirecTV believes I should pay $549 for upgrading my receiver. Oh yeah, and since I’ve upgraded that receiver, I’ve paid $2300 in fees for the DirecTV service, which I still think is great. So this is DirecTV customer service. Call up and ask for a new HD receiver, don’t get informed of a contract. Call up to cancel the service, not informed of ETF fees. DirecTV screws up sending shipping materials, pay $150. And DirecTV consistently scores high in JD Power and Associates Best TV Service Provider ratings. If DirecTV is a good service, what must be going on at a crappy service like Time Warner? Do they send thugs out to beat up their customers? Okay, I know this is just my personal customer service rant, but there is a business and technology issue here. Subscription services love that customer have skin in the game. In music we were happy that customers would download tracks, make playlists and share with friends. It meant a majority of customer weren’t going anywhere anytime soon. And we’re invested in many of the same ways with television. I was recently trying to sell the value of DirecTV (pre ETF-GATE) to a friend who was moving to a new place. He couldn’t even consider it. His partner had all her shows from her service on her DVR and she wasn’t about to change. “It’s the third rail of our relationship.” I get it. But in some industries, like cable and cellphones, the value of the new outweighs the old. Just for kicks, I went to the DirecTV site and as a new customer, I’d get a state of the art HD DVR for free and I’d receive half off programming for the first year in a two year commitment. For the $549 they want me to pay for the ETF boondoggle, I could get a nine months of service. 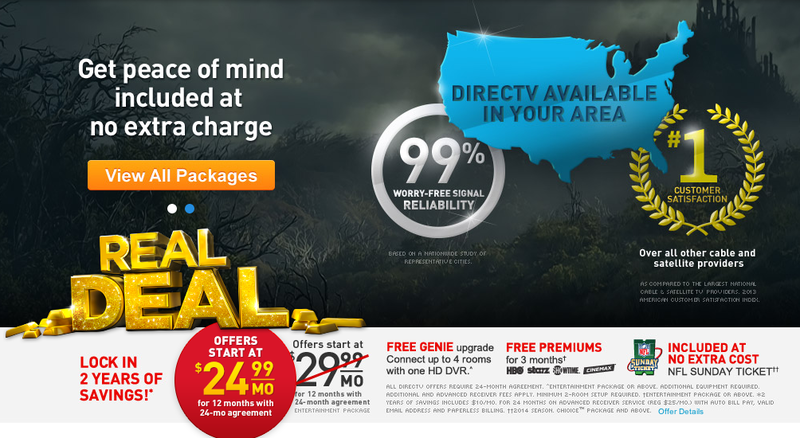 DirecTV is in a war with cable and Dish to win subscribers. So acquiring a new customer is prioritized over making current ones happy. The company obviously figures that they have their hooks into their current customers really deeply, either from the product, equipment or just good ole inertia. After all, who wants to deal with customer care unless extremely motivated. This is a massive mistake. Acquiring a customer is really hard and costly. Keeping a current customer happy is much more economical and leads to much higher satisfaction of the entire base. You can abuse your customers as much as you care to when a company holds quasi-utility status, where the options are limited. But the explosion of choices in media has meant that people can cobble together their own experience outside of traditional options for entertainment. A combination of YouTube, Netflix, Hulu and a host of other services is starting to fray the bundle pay televisions have had for a long time. The war for the customer is getting much more challenging every day. Here’s a few of guidelines for retaining customers. Create a lifestyle turnstile: A couple years ago a product manager at Netflix told me they weren’t acquiring any new US customers, but instead they were just signing up former customers. He found that customers came and left the service for a variety of reasons, mainly due to seasonality. Companies need to consider what is going on with the customers life. Perhaps they just can’t afford your service that month, or maybe they’re going on long vacation. Companies should think of their services as a turnstile that allows the customer to join and quit at will. I would suggest making it as easy to quit as it is to sign up for the service. Carrots Work Better Than Sticks: I don’t have the data to know if Early Termination Fees actually work in keeping customers around. But I know what they’re very good at: terminating any good will you have with a customer. I sorta get the reasoning for cellphone companies to charge you a fee for leaving early, as they are deeply discounting the cost of the phone. But it’s so unclear why you are paying what you are paying. I’m sure it’s clear how I feel about the DirecTV ETF. It seems like that one was strictly designed to stick it to someone leaving. I would suggest customer pleasing offers (free month of service or upgrades on equipment) make more sense than using a lock and chain on your customer. Set them free: Look, everyone wants to save the leaving customer. Keeping a customer by giving them a better offer is always a great way to tease out what the customer complaint really is about. Maybe it’s the cost. Maybe it’s the value proposition. Maybe they just need a break. What really gets me is when you get multiple save attempts at saving the customer. It’s is really aggravating and can leave a bad taste in a leaving customer’s mouth.